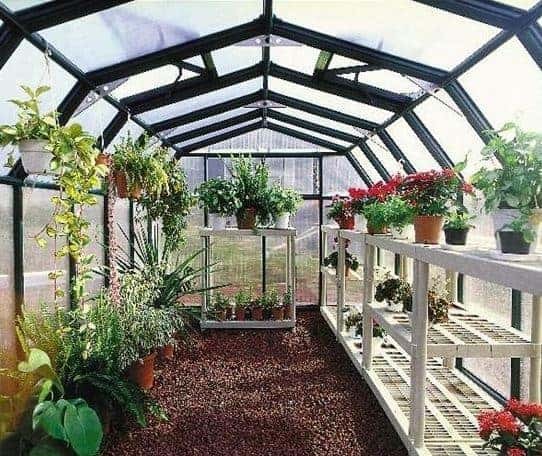 Wow – the Rion Grand gardener’s plastic greenhouse is the gardening enthusiasts dream! This incredible 8x20ft space offers so much potential for all of your gardening projects. Flowers, plants and vegetables – whatever you dream of growing in abundance, you can do it all with this trusted greenhouse offering the ultimate protection. You might also like to see the top 20 plastic greenhouse currently on sale in the UK by visiting the WhatShed plastic greenhouse awards league table. The Rion Grand green coloured greenhouse is a fantastic choice for the growing enthusiast. It is a great size which means it is spacious enough to grow plants, vegetables and flowers of varying size. The structure is such that it is able to trap heat so you can even grow exotic plants that are not available normally in the UK. Constructed from 4mm polycarbonate glazing with a thick resin frame and with special UV protection against harmful rays this is a superb product at a very reasonable price. Your plants and vegetables will no doubt flourish. With a height of 8ft the greenhouse interior has a spacious feel, with the added advantage of being able to grown tall plants with ease. Internal freestanding shelving can be added to have numerous projects, flower, plants and vegetables organised into sections and levels. Due to the warm temperatures created by the greenhouse you will be able to grow exotic plants, flowers and vegetables that would have been previously impossible in the typical British climate. 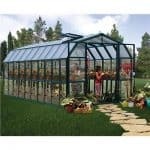 With a large purchase such as this Rion Grand Gardener’s Plastic Greenhouse you may naturally have questions that need answering or a detailed run-down of the many features and inner workings of this particular greenhouse model. Below we identify and discuss this greenhouse’s many features and elements of the design and construction you may find interesting. Exterior: The gardener’s green colour of this greenhouse will blend into its natural surroundings of your garden or land superbly. The 360 degree nature of the floor to ceiling glazing gives this structure an outside-in feel, similar to a conservatory or sun room. The glazing and resin frame are 100% protected from UV rays, giving you and your gardening projects the ultimate protection. Virtually maintenance free, there is a roof vent in which fresh air can circulate around the interior. Interior: The 8x20ft super-spacious interior gives you ample opportunity to make a start on all of those gardening projects that you have been dreaming of. From plants and flowers to vegetables you can grow them all in a multitude of ways, with hooks for hanging baskets and the option to add freestanding shelving. Windows & doors: With hinged double doors including a latch, transporting items between your garden and the greenhouse couldn’t be easier. 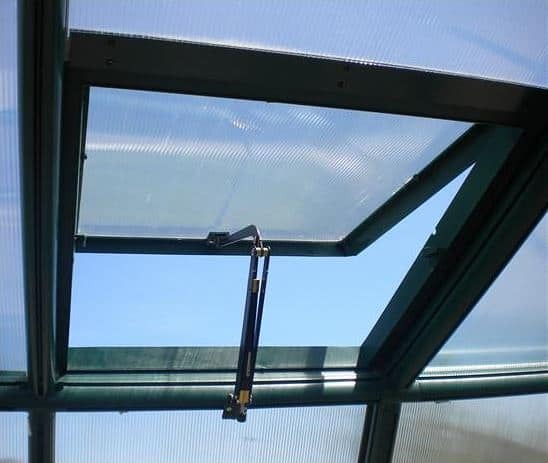 The 4mm twin wall polycarbonate glazing holds the advantages of being both clear as glass yet virtually unbreakable. The roof panels do partially open to allow fresh air inside. Security: No security fittings have been added to the greenhouse; however a padlock or similar security device could be added to the double door latch if security was an issue. Rion Grand Gardener’s Plastic Greenhouse: How easy to build? If you look at this super-size greenhouse in amazement and wonder how on earth you are going to be able to assemble it, particularly if you have limited DIY experience, then fear not as Rion have made the assembly as easy as possible. With a full instruction manual containing easy-to-follow diagrams and instructions that detail every step to assemble this greenhouse correctly, you are in safe hands. We recommend that two people undertake assembly of this greenhouse together due to the sheer size of the structure, height of the roof and amount of glazing to be fitted. Rion Grand Gardener’s Plastic Greenhouse: What is the overall quality like? Rion design and manufacture garden sheds and outdoor buildings to fulfil a range of needs, from the small family needing a small outdoor storage solution to the gardening enthusiast dreaming of a super-size greenhouse such as this amazing model. 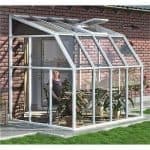 This fully polycarbonate glazed greenhouse allows a significant amount of light and warmth to allow your plants, flowers and vegetables to grown in optimum conditions. The 4mm twin wall polycarbonate glazing is a clear as glass on the side panels giving your greenhouse a premium look and feel. The glazing is virtually unbreakable, meaning that you don’t have to worry about breaking any windows whilst pottering around inside and is also fantastic for security purposes. The strong resin frame of the greenhouse provides a solid structure which will no doubt still be standing in your garden for many years to come. 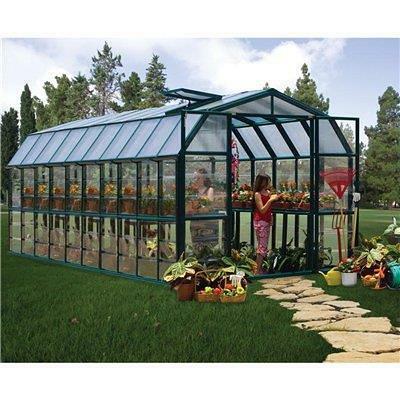 The material from which this greenhouse is constructed makes it virtually maintenance free. Should your greenhouse require a clean, simply hose down or sponge wipe with water or a soapy solution for an extra sparkle. A gardener’s dream, this amazing greenhouse ticks all of the boxes. With an 8x20ft interior and plenty of opportunities for organising your flowers, plants and vegetables just how you want them, you will be pottering around in this greenhouse for hours at a time. Priced accordingly to match its ample size, we feel this greenhouse would be fantastic for the larger garden/piece of land and certainly a step up from the traditional garden shed or small greenhouse. I have bought this greenhouse a year back and I don’t have any major complaints. It was a tad difficult to setup, for the instructions being not so clear. But after working on it for 4 long hours, I could finally make it stand. But the longevity of the material is not as good as promised. Few days back I saw some damages on the plastic resin frames. They seem to have disintegrated. I am not having any problems due to this right now, as they are small damages but I am immensely worried about its future condition. If this whole frame gets damaged gradually, I will have to replace it. But the problem is I have spent a fair amount of money on this greenhouse and I will not be able to afford another one sooner. I recently opened a nursery and didn’t want to spend a large amount on a nice greenhouse. 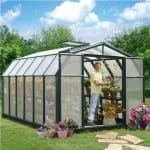 I realized during my search that greenhouses were very expensive. My friend steered me to this site and I fell in love with this greenhouse. It is very spacious. It fits a lot of flowers and I still have room for me or customers to browse without being cramped. It traps the heat, so I can grow my exotic plants if I want. The double doors make it easy for me to carry large plants in or out. I can also wheel a cart inside to make it easier moving plants. The large windows allow a lot of light to enter, so no matter how much light my plants need they will receive it. It has a height of 258cm making it great for growing taller plants and I have a lot of headroom since I’m tall. The windows are polycarbonate so I don’t have to worry about breaking them. It also protects me from harmful UV rays incase I have to spend long periods inside. The Rion Grand Gardener’s Plastic Greenhouse was a great purchase and I look forward to using it to showcase my beautiful plants.